1880s autograph album that belonged to Caroline Augusta Maynard, "Lina", of Lowell, Massachusetts, compiled while she was a student at the Lasell Seminary for Young Women at Auburndale, a village in the City of Newton, Massachusetts. The Seminary is now known as Lasell College. See another post that features the 1870s/1880 autograph album of Frank E. Bramhall, whom Lina would marry on 3 June 1885 at Lowell, Massachusetts. Lina's album measures approximately 7" x 4-1/2" and contains the sentiments of over 70 of Lina's friends and classmates. An alphabetical list of the signers appears at the end of this post. Many of the signers belonged to a sorority or group called "S.D." The students came from all over the United States, with several from St. Joseph, Missouri, and enough from Michigan that they formed the "Michigan Grotto". Caroline Augusta Maynard, "Lina" - some records say Augustus - was born 17 February 1861 at Lowell, Massachusetts, the daughter of Caleb J. W. Maynard and Augusta Caroline (Davis) Wheeler, who were both from Temple, New Hampshire. As noted above, on 3 June 1885 at Lowell, Massachusetts, Lina married Frank E. Bramhall, son of John and Hannah (Platt) Bramhall. Frank was born 20 September 1858 at Lowell, Massachusetts. The couple lived at Lowell, Massachusetts, and had at least three children, two daughters and a son. Frank was in the printing business. Here is the page that Frank signed in his own album [link above]. Lina died in 1928, and Frank in 1935. If you have corrections and/or additions to the information above, or information on any of the signers listed below, please leave a comment or contact me directly. Thanks! Below, a few of the pages. Facing pages were signed by roommates Leora G. Haley of Boston, Massachusetts, and Lizzie C. Stockwell, possibly of Worcester, Massachusetts. They shared Room 38. Lizzie dated her page May 14, 1880. Fannie S. Nason of Rockland, Massachusetts, sketched a pair of shoes hanging from a fence. The page below was sketched on May 22, 1881, possibly by someone with the initials M.R.H. If you can decipher the wording, please leave a comment. Two of the pages had photographs attached. It appears that there were more photographs at one time that became dislodged. One such page was that signed by Emily E. Peabody of Cincinnati, Ohio, and Grace B. Fridley of ?, Ohio. Grace would marry Harry B. Pennell and move to Portland, Maine. Whether the photograph shows Emily and Grace, or Emily, or Grace, with Lina, I don't know. The other page with a photograph attached was signed by Sophie White of Sewickley, Pennsylvania, who inscribed her page in May of 1881 at Lasell. It's possible that the women were Sophie and Lina. And my favorite page, sketched at Lasell in 1881 by A. E. L.
P. V. or P. U.? Sketch of a man and woman drawn [possibly by M.R.H.] on May 22, 1881 at Lasell Seminary for Young women. Can't decipher the title of the sketch. Wonderful sketch of two frames, one of a child wondering why a cat having such a hard time scaling a fence and the other from the other side of the fence where a crab is grabbing the cat's tail. Sketched by A. E. L. at Lasell Seminary for Young women in 1881. Annie R. Bragdon of New York City, signed at Lasell Seminary for Young Women. "The girl that looks like you."
? M. Fisher of Cincinnati, Ohio, signed at Lasell Seminary for Young Women in 1880. Might possibly be Annie M. Fisher but it looks as though there's a first letter before the a. Page signed by Grace W. Fribley of ? Ohio, and Emily E. Peabody of Cincinnati, Ohio. "The next door neighbors", so presumably roommates next door to Lina at Lasell Seminary for Young Women. There's a tintype pasted on the page, presumably of Emily and Grace, or Emily and Lina or Emily and someone else. Grace would marry Harry B. Pennell and move to Portland, Maine. Grace A. Garland of Biddeford, Maine, signed on May 26, 1880; "a raving Maine-iac", "One of your friends at Lasell"
Kittie A. Griggs of Chicago, Illinois, signed at Lasell Seminary for Young Women on May 23, 1880. Straddling the top of the facing pages: "Chummies". The signer on the right facing page was Mattie L. Lorimer, also of Chicago, who signed her page a day earlier on May 22, 1880. Leora G. Haley of Boston, Massachusetts; signed at Lasell Seminary for Young Women on May 14, 1880. Stradding the top of this page and the right facing page: "Room Mates No. 38". 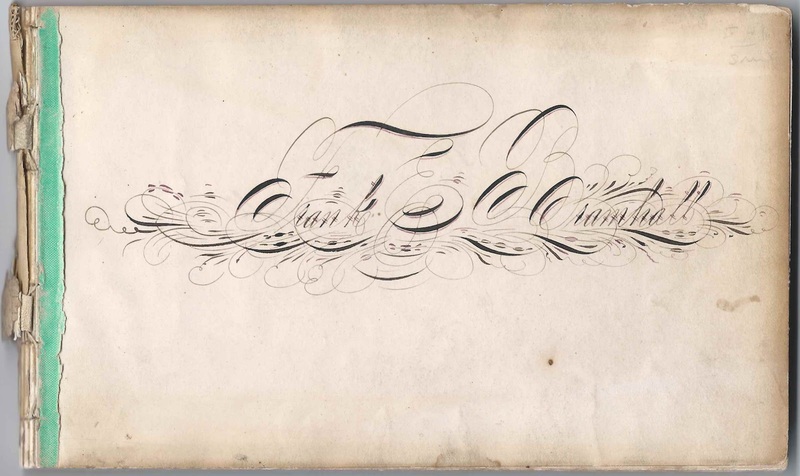 The right facing page was signed by Lizzie C. Stockwell at Worcester, Massachusetts, on May 14, 1880. Emma L. Hax of Saint Joseph, Missouri, signed at Lasell Seminary for Young Women on June 10, 1881. She would marry H. L. Smith on October 8, 1884 at Buchanan, Missouri. Emma L. Hax of St. Joseph, Missouri, signed at Lasell Seminary for Women on May 24, 1880. Her sister Bertha C. Hax signed the right facing page. Emma signed two pages in the album. Bertha C. Hax, signed at Lasell Seminary for Young Women on May 24, 1880. Her sister Emma L. Hax signed the left facing page. Left of facing pages signed by Minnie Marie Higby of Charlotte, Michigan, at Lasell Seminary for Young Women on March 2, 1881. I believe it was Minnie Marie Higby who signed a page later on in the album as Minnie Marie. Edith E. Lorimer of Chicago, Illinois, signed at Lasell Seminary for Young Women; presumably Edith Elizabeth Lorimer who later married Gilbert E. Porter in 1888 in Cook County, Illinois. Mattie L. Lorimer of Chicago, Illinois, signed on May 22, 1880. Straddling the top of the facing pages: "Chummies". The signer on the left facing page was Kittie A. Griggs, also of Chicago, who signed her page at Lasell Seminary for Young Women a day later on May 23, 1880. Josephine Mason of Washington, D.C., signed at Lasell Seminary for Young Women on May 13, 1880. She sketched a kitten in a slipper. Sephie G. Mason of Boston, Massachusetts, signed at Lasell Seminary for Young Women on March 8, 1881. An 1884 Lasell publication has a note from Sephie that she was studying Latin, Italian and music and residing at 407 Montgomery Street, San Francisco, California; it also notes that her father had recently died and that he had been in business at one time at Fall River, presumably Massachusetts. Lina A. Maynard, album owner. She collected the sentiments in the album while she was a student at Lasell Seminary for Young Women at Auburndale, Massachusetts. Fannie S. Nason of Rockland, Massachusetts; presumably Sarah Frances Nason who would marry Frederic O. Baker at Rockland, Massachusetts, on 18 September 1894. She drew an interesting sketch of two hanging shoes: "The down-trodden, uplifted or the weary souls (soles) at rest." Page signed by Emily E. Peabody of Cincinnati, Ohio and Grace W. Fribley of ? Ohio. "The next door neighbors", so presumably roommates next door to Lina at Lasell Seminary for Young Women. There's a tintype pasted on the page, presumably of Emily and Grace, or Emily and Lina or Emily and someone else. Jennie M. Smith of Flint, Michigan, signed at Lasell Seminary for Young Women on May 26, 1880. "Michigan Grotto"
Roberta F. Steele of Omaha, Nebraska, signed at Lasell Seminary for Young Women on May 13, 1880; not positive of middle initial and surname, but there was a Roberta Frank Steele from that era in Omaha, Nebraska. Abbie R. Turner, signed at Lasell Seminary for Young Women on June 11, 1880. "Michigan Grotto". Presumably the Abbie R. Turner who was born in Michigan about January 1862, the daughter of James and Marian (Monroe) Turner and who married Franklin L. Dodge. They lived at Lansing, Michigan. Sophie White of Sewickley, Pennsylvania, signed at Lasell Seminary for Young Women in May 1881. Photograph of two young women attached, one of them presumably Sophie.